You are 6 months and 11 days old today. I can hardly believe it. Mommy is already planning your 1st birthday party...even though I know you won't remember it. You are drinking 4 bottles of 7-8 oz. each day and eating 3 meals a day of solids. Perhaps you should be drinking more formula but you have been struggling with constipation lately and trying to feed you the bottle has been a chore, although I enjoy feeding you solids and seeing your face when you figure out what it is your eating and get excited. You like almost everything you've tried which includes: sweet potatoes, green beans, squash, carrots, sweet peas, applesauce, bananas, peaches, pears, mixed veggies, among others. You just recently tried puffs courtesy of your Auntie Charity and you enjoy those too...though I'm trying not to spoil you with those too much. You flirt with the ladies everywhere we go: the grocery store, restaurants, and especially church. The ladies in the nursery absolutely love you. You just flash that precious toothless grin of yours showing off your dimples. You are sleeping wonderfully these days. You usually go down around 7:30 and sleep until 6 or after. Thankfully, your 'Tay Tay' was around many weekends to give mama some extra sleep when you did not sleep so well. Except for the last few weeks which we now believe were due to constipation, you are a happy boy. You love bath time, soft blankets, your jumperoo, your new johnny jump up, your stuffed train, your giraffe that sings the ABC's and your monkey blankie. You are starting to crawl. You don't have it down perfectly yet but you sure do get around. We have to constantly watch you though because you like to leap forward and have whacked your head more than once giving mommy a slight heart attack. I always watch you carefully after that to watch for any signs of concussion...call me paranoid. But I only get worried when it actually makes you cry...which isn't as often now. Keeping you still to change your diaper is like trying to battle a champion wrestler. Mommy and daddy have to lower your crib, something we will probably try to tackle tomorrow because you are just about to pull up to a standing position. I don't doubt in the next few weeks you will. You already pull up on your knees and peer through the bars like you're in jail. It's adorable...and terrifying at the same time. Why are you growing so fast? I absolutely adore you and even though there have been some exhausting and frustrating moments in the last few weeks, that sweet smile makes it all worth it. Daddy and I pray over you every night when we put you down and it has been such a sweet time for us. We consistently pray for the day of your salvation, praying that you will one day have a saving relationship with our Lord. Our prayer is to raise you up in a loving Christian home where we practice what we preach. For the last few days, we have been dealing with an extremely irritable baby boy. For the past 2 weeks, feeding him his bottles has been a pain in the rump. But, we combined some advice together and today was the best day (feeding and mood wise) we've had in a while. Gabriel had his 6 month check up on Monday and was healthy as a horse. He was 18 lbs and 27 in long. He had no ear infections (which I really thought he did). The doctor just said he was a really independent boy. Oh joy, we thought. Are we seriously going to be dealing with this until he learns how to actually hold his bottle? And what was with the constant hummy style fuss? She just said it was teething and we should try baby ibuprofen. Soooo, we got the ibuprofen and I purchased a Playtex Ventaire bottle that has the curve in it. The following day, he did better with the bottle and has done better with the bottle since then although then he started to do this whole fuss, eat, pull away from the bottle, fuss, eat, pull away from the bottle. He was no longer trying to hold it, he was just plain fighting it. Great! Now what? He was fussy most of yesterday and by last night, I was utterly exhausted. After I put him down for the night, I just went into the bedroom and cried. I didn't know what to do! Where was my happy boy? I'm supposed to be enjoying this stage and I just wasn't. On a lighter note, Gabriel got his first doses of the beach last weekend and Tuesday. He wasn't a fan on Friday, but loved the pool on Saturday. We went to Treasure Island both days because Jason's aunt got his mom a 2 night stay on the beach and Jason's older sister and niece and great niece were there. Yes, my 27 year old husband has a great niece. His niece Samantha is older than he is but I LOVED her. She is such an awesome person and such a faithful woman of God. And her 4 year old daughter Abby is a doll! On Tuesday, we went to Daytona (the opposite coast) where my mom was staying. He didn't mind the beach as much and actually played in the sand until he tried to eat a handful. Then we decided to take him back to the pool side. Mom and Faye took him in the pool while we got to take a nice walk on the shore hand in hand. Gabe has been sleeping like a champ the last few nights (9-11 hours a night). I hope he keeps it up. He's getting earlier bed times now so hubby and I can spend some time together. Jason's brother Danny and his wife Aeoli are coming over tomorrow so I have to finish getting the house cleaned up before they get here. I will be cleaning like a maniac tomorrow and then we'll be having smoked sausage, shrimp, and pepper skewers over a bed of rice and Jason made a butterscotch cheesecake...yummo!! We might even do s'mores with a fire if it's not too too hot or raining tomorrow night for Jason to start one. Guess I better get going. Maybe I can get some more cleaning done before going to bed tonight. Sometimes, being a mom is not all fun and precious moments. Sometimes, it's downright frustrating. Don't get me wrong. I absolutely love that little wiggly jiggly monkey of mine and would not trade him for all the riches in this life. But sometimes, that sweet adorable son of mine, pushes those buttons. At this point, with that boy at 6 months old, I would do anything to figure out how to give him a bottle and have him not fight me on it. I think he is so crazy about solids now that he just either doesn't care about the bottle anymore or the one he has isn't working for him. I honestly do not know. I don't know what to do. And THAT, is the worst part. I feel as his mother I should know all the answers...and I don't. How am I supposed to fix it when I don't know what the real problem is. Anyone out there feel me on this? I love him more than life itself but this stage, as exciting as it is and has been and will continue to be, is wearing me thin. I'm already used to the exhaustion. That I can handle. Being a mother is just exhausting. And I am okay with that. It's worth that smile, that giggle, that way he looks at me with those big blue eyes that say he knows exactly who I am and he loves me. Why is he fighting me feeding him the bottle? Why is he making that hummy fussy noise that I've never heard before? Why is he happy one minute and fussy the next? Sometimes I wish I could just quit him on the bottle and feed him solids from now on because that is what he likes...but I know he needs the nutrition the formula gives him...and so I fight, sometimes for an hour, just to give him his 7 oz that he has, up to this point, guzzled down without a problem. We're taking him to the beach today for the first time so I'm hoping he loves it and does well and that he sleeps well tonight afterward. I love when he discovers new things and I guess that makes these times worth every bit. This has become my release in a way and unfortunately, life has been so crazy busy lately, that I have barely had time to actually sit and relax it seems. There are so many things going on in our lives right now that it's actually hard to keep it all straight. However, God remains faithful as always and even through the tough times, He is always there. Since my last post, so much has happened. He's been making his wooden crosses and I swear everywhere we go, I get a compliment on the one that I wear. If you'd like to purchase a wooden cross necklace made my him, let me know. He's got several designs, sizes, etc. and if you have a certain design idea, he could probably make it for you. He makes other things too and will be working on creating an inventory soon. We're hoping we can get into the Downtown Lakeland Curb Market in September to sell some items. Today, he got hired for a job where he will be doing some repair/remodel things in a house and bringing home more money in one week than he would in a month working for his old boss. Praise the Lord...especially since my check was short this month...again. But, we trust in God and He is ever faithful. Lately, for me, I've just not been myself. I've had some issues that I didn't even realize until I actually started talking them out with my mom. The one that hit me the most was that I don't feel like I have any friends here. Sure, I have acquaintances and people I call "friend" but I'm talking about that friend that you can tell anything to...that friend that you can be serious or stupid with...that friend that will sit and do nothing with you or go crazy doing something with you. And it really got to me. I miss that girl time. Sometimes I wish I was rich and had the money to fly to Canada every month to spend time with the one person I feel has really been THAT friend to me in the last few years...and still is when she comes for a visit. But it's hard not to have that here. There were other things going on that I'm not going to address here but things are much better now and I am feeling a lot better about things. Gabe slept awesome last night and I'm hoping for the same tonight. He is getting so big...he's eating like a champ and still trying to crawl. I'm buying a jumperoo from a lady on craigslist tomorrow so that he can go crazy in that...he keeps trying to jump in his exersaucer and unfortunately, that is just not meant for jumping:) We went on our first vacation to Alabama to visit with my grandparents, Gabe's other set of great-grandparents. 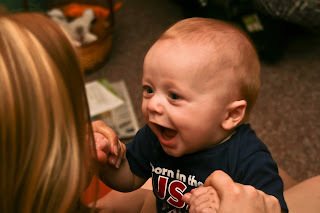 He did awesome on the long car trip and even though he had his first cold up there, he was generally a happy boy. He loved interacting with great grandpa and freaking great grandma out by just staring at her. Now that was hilarious. I am eating healthy, walking every morning with Gabe, hubs, and our boxer, and I joined Planet Fitness (starting tomorrow). My skin has cleared up, my energy is higher, and I just feel better overall. Thankfully, it seems that God has taken away my cravings for things I once ate way too much of: pizza, ice cream, cookies, soda, etc. I just plain don't want those things now. If it's offered to me, I say no immediately. I don't even give myself the chance to think about it. I don't focus anymore on the number on the scale but rather the small victories that come along with starting a new healthy lifestyle. I feel really good about it. We've headed into month 2 of the in laws living with us and things are going pretty well. Of course there are things that get on my nerves as you would expect with family living with you but we get past it and through it and ultimately have fun together. Today, my s-i-l and I painted a cardboard gingerbread man that Jason drew and cut out for Mileena's 1st birthday party. It's a candyland theme and we're also going to have a cardboard castle which we can hopefully get to tomorrow. Earlier this morning, Gabe got to spend some time with his cousin Preston who is a mere 5 days older. They were cute together. We're hopefully going to have a Sister-in-Law night this week if we can make it happen. I think it would be good for us to get together just the 3 of us...we haven't done that before. Well, I do believe this has been long enough. If you've stuck with me, thanks. I appreciate your perseverance. It is time for me to go spend some time with the hubs. Ciao!